You may want to consider therapeutic riding as a recreational activity if the participant a wants to learn horsemanship skills and not just how to ride a horse. FtR provides riding services with adaptive equipment if the participant needs adaptations for riding that other barns may not be able to provide. Focus: Riding a horse while working on independence for sport, recreation and education. Benefits: Increase quality of life and teach riding skills with adaptations as necessary. Lessons: Performed by a PATH Intl. certified therapeutic riding instructor. Therapeutic Riding teaches skills to participants as a recreational activity. The participant works with and influences the horse to reach their personal goals. Therapeutic riding has provided social, educational, and recreational opportunities to individuals with disabilities for more than a century. By utilizing the special bond between humans and horses, Equine Assisted Activities benefit students of all ability levels both inside and out. Students can begin our therapeutic riding program at four years of age. Safety is our number one priority, for the rider and the equine alike. Students will learn skills for independent horseback riding as well as enjoy fun activities while on horseback. Students become prepared to participate in other exciting events including: Special Olympics, horse shows, inclusive summer camps, and other continuing education series. Lessons are performed by a PATH Intl. 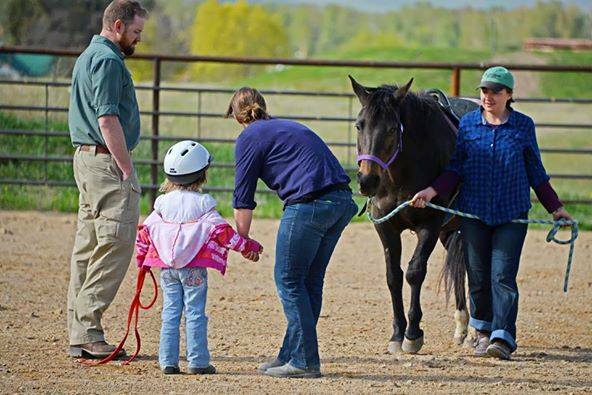 certified therapeutic riding instructor, and riders participate in activities on our safe, calm, and patient horses. Therapeutic Riding teaches skills to participants as a recreational activity. The participant influences the horse to reach the goals. FtR instrctors, athletes, and volunteers will participate in the Montana State Games for 2016. For more information please contact us . The Equestrian portion of the Summer games will be held at a location TBD.